YouTube - Garrick DeMeyer of RoyalConstrictorDesigns.com takes a look at a recent Crystal Ball python clutch. Garrick gets nice odds on the babies produced, and spends a moment covering the genetics of the Crystal project. 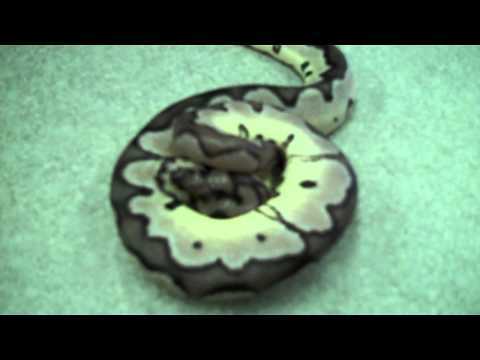 YouTube - Garrick DeMeyer of RoyalConstrictorDesigns.com gives a quick video update on his Toffee Ball python project. YouTube - Garrick DeMeyer of Royal Constrictor Designs takes a moment to cut open some exciting Ball python egg clutches. Clowns, Mimosa, Pastel Champagnes, and more! YouTube - Garrick DeMeyer of RoyalConstrictorDesigns.com shows you some tips and tricks on feeding frozen (and now thawed) rodents to your snakes.